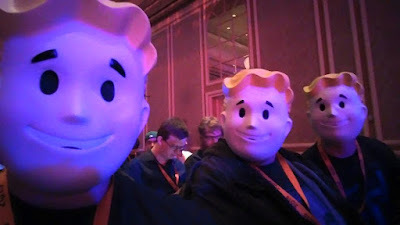 Geekmax: Fallout 4 Sneak Peak @ Quakecon 2015 - What Did We See?! Fallout 4 Sneak Peak @ Quakecon 2015 - What Did We See?! Quakecon 2015 has been a blast so far. This is my 6th year in a row attending and my 1st year attending the BYOC LAN Event, which is where I am right now as I wright this article. But that's not why you're here. Lets talk about Fallout! Those lucky enough to attend the event got a chance to see an exclusive sneak peak behind the scenes development, and all new extended gameplay footage of Fallout 4, Bethesda Game Studios newest title being released on 11-10-15. There were no cameras allowed in the theater just like the sneak peak of i.d. 's new DOOM (4/reboot/just DOOM) last year at Quakecon, and Bethesda's Game Director, Todd Howard, did not disappoint. Upon entering Everyone was given a very cute (and creepy) Vault Boy mask. It was later revealed that the special "Pipboy Edition" of the game is completely sold out, however three of the masks had silver star hidden somewhere on it, and if you got one of those, then you also got one of the 'Pipboy Editions'. Super cool! First was some more concept art, including art from the late Adam Adamowicz, who passed away in February of 2012, which gives you an idea just how long they have been working on this game. And some history of the fallout lore and why things are the way they are within the game series which was kinda old news but interesting none the less. Howard mentioned that they really wanted to let the player experience the world of Fallout before the war since it is just as rich as the post apocalyptic post war wasteland. Moving on, we didn't get to see anything new regarding the home/base building or crafting elements of the game, but we did get to see just how much work went into all the characters performance capture which was par for the course for most Triple A titles these days, but still impressive. What wasn't par for the course was how much detail went into the much loved character Dogmeat, one of about a dozen companions in the game. Dogmeat is largely modeled after a real pet German Shepard owned by one of Bethesda's level designers. Side by side comparisons were shown of Dogmeat and the real dog so we could see just how similar they look and how realistic the animations were, and they were spot on. This is pretty impressive considering it's almost impossible to do real "motion capture" with an animal like you can a human. Other companion details included things like relationships, which will change and develop depending on the story and the way you play the game. You can develop romantic relationships regardless of gender (which was met with huge applause)with most of them. We also got a small sample of Mr. Handy's extensive name database. If you name your character Todd, he will call you Mr. Todd.... McFly? Mr. Mcfly... Fuckface? Mr. Fuckface. That is not a joke, he actually called us Mr. Fuckface. Bethesda's biggest strength has always been massive amounts of detail and freedom, and this is a prime example. Next was a look at the skill system. Similar to Fallout 3, each time you level up you will be able to pick a new "Perk" which gives you certain benefits/abilities and helps mold and shape your character into who you want him to be. Unlike Fallout 3, all of the perks available to you depend on how high your S.P.E.C.I.A.L. stats are (Strength, Power, Endurance, Intelligence, Agility, and Luck) , which you will put points into during the character creation process. Familiar but different, and further, each perk has multiple tiers so you can increase the power or effectiveness of a perk by picking it more than once... all of them. This gives the player the ability to create even more types of character classes and play styles than ever before. Finally, lets get to the good part... the gameplay footage! I will try to describe what we saw as best I can, but try to use you imagination as I can only do so much with words and the more familiar you are with Fallout 3 the more you will understand what I'm saying. We visited one of the cities in the game which had been over run with Feral Ghouls, but a group of Raiders have also moved in and are trying to take over. Basically we got to seem them all get cleaned out. One of the 1st thing I noticed about the Ghouls were their cloths. They all looked different as far as I could tell, which gives each once of them a little bit of personality and reminds you that these things were once people just like you. We saw them get strategically picked apart in a typical combat situation to showcase just how improved the combat was. Limbs were blown away and the Ghouls didn't go down, but kept coming. The way they moved were much slinkier and creepier than previously in FO3/NV. Gone are the static NPC's are just kinda stand there and wander around aimlessly until they hear you or spot you. These seemed to kind of sneak up on you crawling through a window right as you turned around to see them. Then once the fight was on, it was brutal and bloody. Fallout 3 was bloody and gory, but there was an inescapable campiness to the gore. The campy side is still there in Fallout 4, but it's a little more understated when it comes to combat. A great analogy would be to compare TES IV: Oblivion's combat to TES V: Skryrim's combat. That increase in polish and handling I think would apply to FO3 to FO4. The Raiders where just would you would expect from a Fallout game, just more polished, more realistic. The way they interacted with each other, you, and the Ghouls (whom were not friendly with the Raiders) felt much more natural and real. This is a running theme with Fallout 4 in my opinion. Think about what Fallout 3 looked and felt like for a moment, and now imagine everything is more fleshed out. You can drink from a water fountain and see the water flow out. Use a stimpack and see yourself quickly jab it into your body. Wanna throw a grenade? Press which ever key /button throws grenades, no longer do you have to switch weapons to a grenade to throw it. If you've seen any footage of Fallout 4 already you may have noticed how V.A.T.S. no longer stops time, but slows it way down, and improves the pace of combat greatly. Also you may already be aware of the way dialog functions and how you no longer have to "lock on" so to speak, to an NPC to talk to them. This logic extends even further with the looting of items from bodies, containers, etc.... no longer does your game essentially pause and bring up and inventory type interface, you just target the items and take them or pick them out from a list. This all seems like small improvements but when you combine everything it just make the entire game look more natural and less compartmentalized. The last thing we saw, when we were close to cleaning out all the bad guys, it appeared you could call in a vertibird and when it landed, two troopers in full power armor with mini guns hopped out and joined the fight to help finish them off. It was like a scene from a gritty war movie. The Vault dweller pulled out his missile launcher and we got the slickest most badass kill cam shot I've ever seen. He whipped up the launcher and aimed with the end pointing right at the camera aaand blamo... splattered Raider, queue Fallout 4 logo. Show over. It's 5 a.m. as I finish writing this article and I'm not really sure how to end it. So this is the end I guess. I hope you enjoyed your stay. I'll be here all weekend. Don't forget to tip your waitress and drive safe.